There are certain roads, especially if you live in a rural area, that are always in need of patching! It seems like the trucks will be out there filling the potholes, only for them to come back a few months later, even bigger than they were! 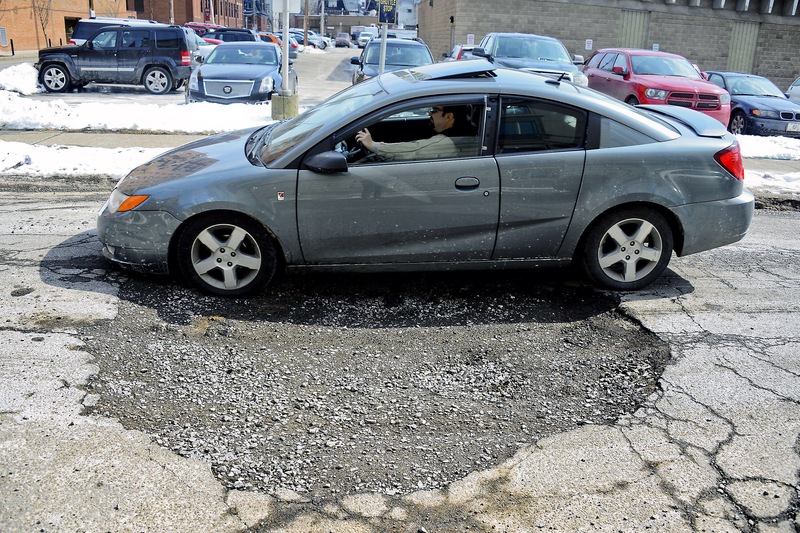 You’re used to dodging said pothole, then you get used to driving on a smooth surface, then BAM! The next thing you know, you’ve ran smack dab into that same danged pothole you hit a couple of months ago! It catches you completely off guard, because you were going fast, because it seems like just yesterday the road was smooth! Now, your car is out of alignment, your drink spilled all in the floorboard, and you got a crick in your neck from the sudden, and profusely intense jarring. In reality, the road wasn’t smooth just yesterday! It’s just that the pothole’s patchwork had gradually worn off, and (seemingly) suddenly there’s a gaping hole. Ah! Such is life! We fight through trials, learning to dodge the enemy’s potholes. Then, because we’re human, when things are going smoothly, we get relaxed and start moving faster. Maybe we sleep later and don’t spend as much time praying. Or maybe we watch tv instead of reading our bibles. Or we put our jobs before God and our families. Either way, our focus is not on God, and we hardly notice the slight wearing away of His patchwork so to speak. The next thing we know, BAM! We’re right back in the same mess we found ourselves in the last time! It’s easy to want to spend tons of time with God and devour His word when things are bad! But what great sons and daughters we are! When the going gets smooth, we forget all about the One who patches our paths! Personally, I’m so thankful that God never gives up on us, and that He moves in spite of us! I can’t begin to describe the overwhelming tickled-pinkness (because overwhelming joy seemed too stuffy sounding) I’m feeling right now! Y’all, God is moving in big ways! In spite of me! Things we’ve been waiting years to see and hear are coming to pass! All I can say is WHOOT! And thank You Jesus! On one of our visits with Tucker, he sincerely apologized for (his words) not being a good son, manipulating us, lying to us, using us, and being an all around douche bag. Again people, those were his words, not mine! I tried telling him he wasn’t a douche bag, but he said that yeah, he clearly was a douche bag. So I politely, and thankfully, accepted his apology. Yesterday, Olivia and I got to pick him up and take him to his eye exam. He brought his notebook along, so that he could read us some stuff he’d written. He’d written out why he hasn’t been a good son, boyfriend, and man. He’d also written out the things he needed to do to be the person God had created him to be, in all those areas. Things like, to stay in God’s word, and to do what it says! I can’t remember everything he read to us, but he has a plan and he’s taking steps in the right direction! He actually wants to be the man God created him to be! It’s obvious that Tucker is seeking the Lord! Y’all, you have no idea how long we’ve waited for this day! Look out devil! This dude is a live wire! I’m not sure if any of y’all remember, but years ago, God gave Steve and I both a vision of Tucker. He was dressed nice, standing in front of people speaking. I’m not sure if he w as preaching, teaching or what, but we both had the same vision, and we both had peace after God had shown us what He had in store for our son! It was funny, I was hesitant to share, even with Steve, what I felt God had shown me. I’m not sure why, but it makes me feel kind of weird to say that God gave me a vision. But that one was as plain as the nose on my face, so I shared! Unbeknownst to me, God had shown Steve the exact same thing! See what happens when we share things God reveals to us?!? Others share too! And miracles happen! Y’all, I, nor anyone else except God, can possibly know what the future holds, but I know this…..God’s promises are true! His word is true! No one can run from Him forever! And His will WILL be done! Y’all, prayer works! We’ve been praying that Tucker would realize who he is in Christ for as long as we’ve been living for the Lord! I’ll admit, there’s been plenty of times when I’ve just been sick and tired of praying! Thankfully, I believe God cuts us some slack for our undeniable humanness. I also know that we have a long road ahead of us, but it’s so nice to see some of the potholes on our road being patched! Posted in Daily devotional.Tagged Devotional, humor, Inspirational, life. Previous Post Sexual Harassment In The Mission Place?! What Happens In Mexico Does NOT Stay In Mexico!